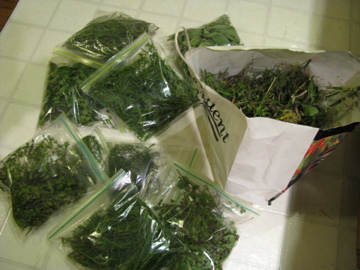 One of my friends kindly dropped off a huge bag of herbs from his mother’s prolific herb garden last night. When I say huge I mean it – It filled over 8 gallon ziplock bags. I feel some kind of wierd herb dealer. The fridge is full of green bags. I can identify mint, tarragon, rosemary, thyme, oregano, fennel and sage although I am not sure of varieties. A couple of things I couldn’t work out though, even with the help of a reference book. Can someone identify this? It looks like a lavender but isn't. Luckily I recently bought Helen Witty’s ‘The good stuff cookbook’ which is an excellent reference guide and goes through every herb and whether it is better to freeze it or dry it and if so how. 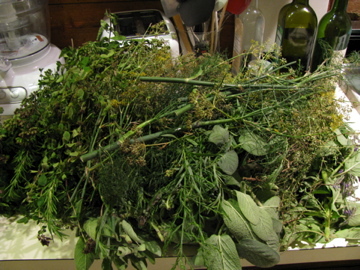 All of these herbs seem to lend themselves better to drying, so when I have time they will make their way from the fridge to the oven, which is one of the methods she suggests. Tonight I used some of the herbs fresh to make a baked tomato dish based on Nigel Slater’s recipe from his kitchen diaries (he only uses rosemary). It was inspired both by my farmers market (and garden) tomatoes and by the fact that my mother spotted NS (one of my heros) in London last week. So jealous. Here are the before and after baking photos. You add the parmesan two thirds of the way through cooking. 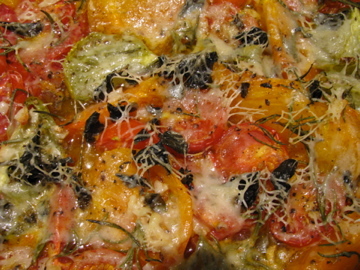 The photo doesn’t show how juicy the tomatoes are when baked. It was easy and delicious and went really well with grilled squash and an arugula salad. I wished I had some crusty bread left to mop up the juices. 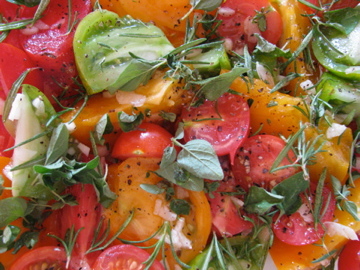 Any other herb suggestions would be welcome – especially to use them fresh with seasonal produce. Last year I made some thyme cookies and ate a lot of baked fish with herbs. 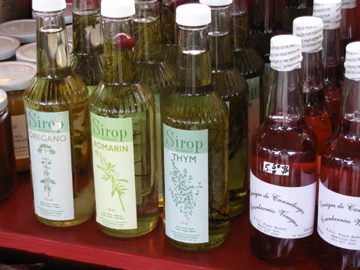 After my success with the ginger syrup maybe I will try making some of the syrups I saw in Montréal. Herbs (aplenty) could be added to the Union Square method of vegetable stock. You use a tablespoon of olive oil and add onions, carrots. etc, etc., but herbs are part of it. You can probably find it on line. It doesn’t cook for as long as some of the watery stocks found in other cookbooks. If you have enough glass bottles and/or jars, you can preserve herbs in vinegar and oils. 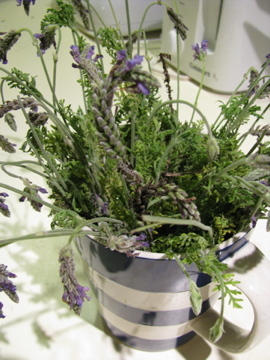 Put some of that lavender looking herb into some white vinegar. 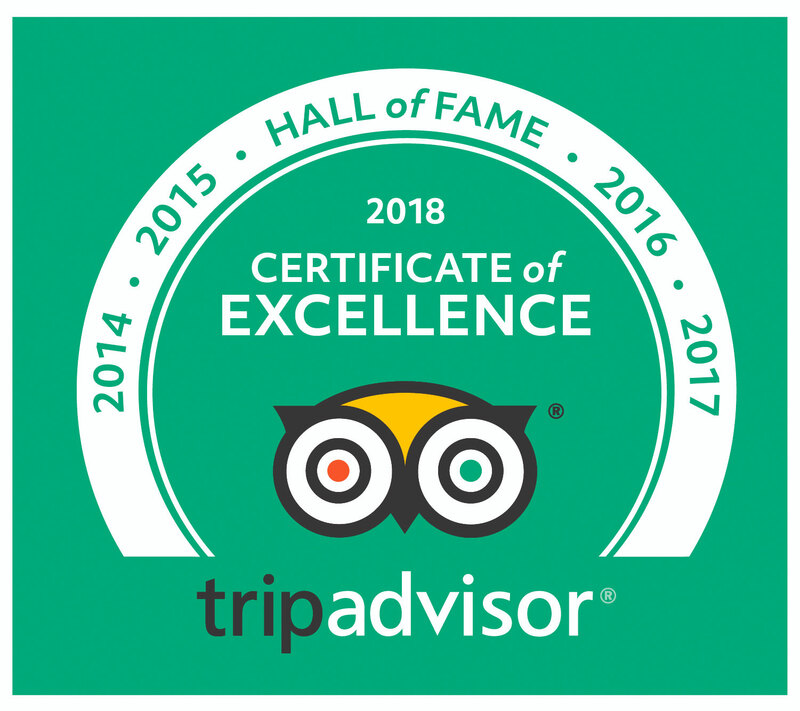 Then even if you can’t find any expert now, it could be looked at months from now. The OSU agriculture dept. might like to have a look at any rare herbs. The best use for the ‘lavender’ otherwise may be to keep insects out of your towels or something. I put some with box and eucalyptus in a fireplace.